Jubilee Nominations stopped, Cancelled and aborted by top officials as ordered by President Kenyatta. - Bana Kenya News, Real African Network Tubanane. Home featured Nairobi Jubilee Nominations stopped, Cancelled and aborted by top officials as ordered by President Kenyatta. Jubilee Nominations stopped, Cancelled and aborted by top officials as ordered by President Kenyatta. The Jubilee Nominations have been cancelled and postponed to a later date. According to the top jubilee officials, the statement given by the party secretary general Raphael Tuju said that the party has decided to postponed and cancel all activities that have been taken party today. There was a lot of irregularities in the whole process and it will be done from Monday next week. In Eldoret, the current governor Jackson Mandago claimed that the Jubilee has failed in the process because of little ballot papers. The same case happens in Kirinyaga County where the former devolution cabinet secretary Anne Waiguru also allegedly that the ballot papers were also marked in favour of certain aspirants. The party secretariat and the Top leaders including the president today evening had a closed-door meeting in the statehouse and agreed to abort the Nominations. 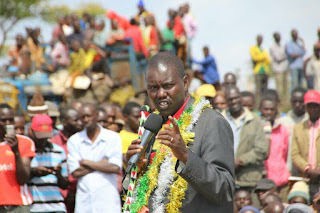 According to Nandi hills, MP Charles Keter and MP Oscar Sudi claimed that the office of the deputy president has directly influenced the Uasin Gishu primaries. The president claimed that the primaries were faced with huge anomalies and it was fair to abort the process and plan afresh. According to the President Uhuru Kenyatta allies, the primaries were not in favour of them and also the majority of the area did not have enough voting materials. The Party leaders said that the next Primaries will be done with new materials in order to avoid further irregularities. The party will change the voting papers colour, serial numbers, size and other indescriptive mechanisms.